HER Excellency the Governor of Tasmania Professor Kate Warner and husband, Mr Richard Warner recently visited Brighton Municipality and took a first-hand look at many of the community and school activities during the visit. Her first visit was at Herdsmans Cove Primary School where Brighton Council’s Australian Day citizen of the year, Steve Bennett, accompanied by principal teacher Carolyn Brown gave Her Excellency an overview of the school’s new bike track. A visit to tagari lia child and family centre gave the Governor an insight into the wonderful programs being conducted for the children and their families. A ‘little mob’ session introduced by Katalyna Health from TAC Health Services was a highlight. Governor Warner visited the Community Men’s shed and was taken on the tour by the manager of Jordan River Services Helen Manser along with staff of the shed. Helen received a Member of the Order of Australia in the general division (AM) for significant service to the community of Tasmania particularly through the establishment and management of regional development initiatives. Next on the visit was the Bonorong Wildlife Park where Her Excellency spoke at length with director Greg Irons and toured the impressive new wildlife veterinary facility. She particularly made mention of this important work at a civic reception at the Brighton Bowls and Community Club. 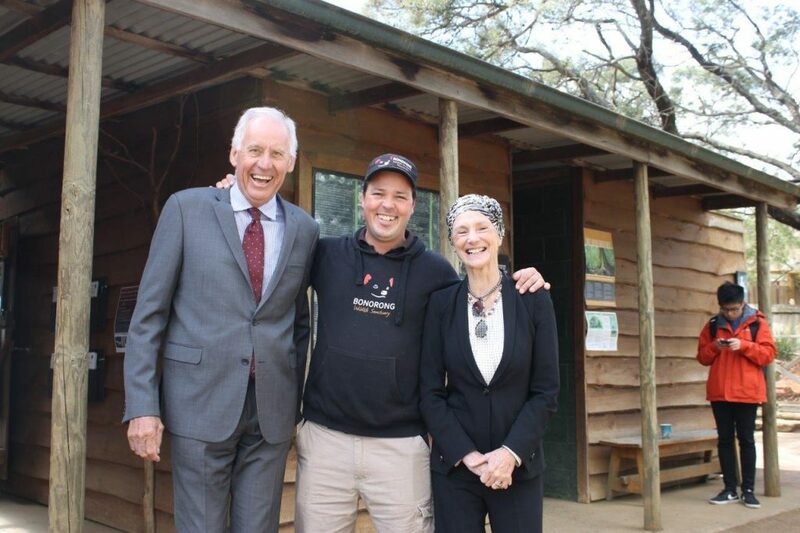 Brighton municipality recently enjoyed the company of Her Excellency the Governor of Tasmania Professor Kate Warner, right, with husband Richard, left, and Bonorong Wildlife Park’s Greg Irons. At the Jordan River Learning Federation School Farm, Her Excellency was met by Dave Watkins, who is a school farm teacher and Mick Davy, who is involved in the Primary Schools Industries initiative. The civic reception at the Brighton Bowls and Community Club gave Governor Warner the opportunity to meet community leaders and organizational representatives, who were also able to talk directly to Her Excellency. The final stop on her tour was a visit to the Brighton Transport Hub. Mayor Tony Foster said it was a privilege to welcome both Her Excellency and Mr Warner to the community to see the important work of community groups and schools, and to be able to witness first-hand Brighton municipality’s continual growth. Her Excellency said she was delighted to have been able to meet community representatives and to see the work being undertaken by community members and to witness special programs being run in the schools, school farm and child care centre.